The Johnny Lee Vincent Memorial Scholarship Program is named in memory of Mr. Johnny Vincent of Greentop, Missouri, a bluegrass pioneer and the father of the Bluegrass Heritage Foundation’s first Bluegrass Star Award recipient, Rhonda Vincent, and bluegrass star Darrin Vincent. Johnny and his family toured the world as the Sally Mountain Show, performing their special brand of bluegrass music. He was known for his unique banjo style and founded the Sally Mountain Bluegrass Festival in Queen City, Missouri. Johnny passed away on October 5, 2014. 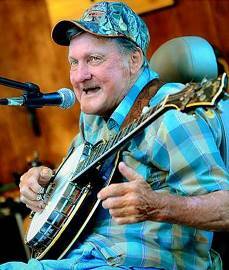 Following his passing, Johnny‘s family and friends made donations to the Bluegrass Heritage Foundation so that we could continue to support young people in their efforts to learn and play bluegrass music in his honor. The Foundation dedicated these funds to the Play It Forward!® Free Instrument Lending Program and to providing scholarships for deserving young people to attend bluegrass and acoustic music camps, programs, and similar educational experiences. We sincerely appreciate the support of Mr. Vincent’s family and friends – and all of our donors and volunteers – who help us to help young people keep bluegrass music alive and going strong. The story of Mr. Vincent’s life appears below. Johnny Lee Vincent was born into the musical Vincent Family on October 18, 1940 in Button Ridge, Missouri; the youngest child of Bill & Erma Vincent. As a young boy, he enjoyed playing baseball, being outdoors, hunting, shooting, fishing, and playing checkers. He began singing at an early age, soon picked up the guitar, and eventually mastered many stringed instruments. The Vincent family made their first recording when Johnny was in his young teens, where he sang Your Cheatin’ Heart. He attended school in Jim Town, Missouri, and started working at the Shoe Factory in Kirksville, Missouri at 16. On May 29, 1961, Johnny married Carolyn Thompson. They made their home in Greentop, Missouri. Their first child, Rhonda Vincent, was born on July 13, 1962. On October 6, 1964, Johnny was critically injured in a car accident near Worthington, Missouri, which left him paralyzed. He regained partial mobility, and walked with a cane until recent years. Music became even more of a focus after his wreck. There was a music party almost every night at the Greentop residence with many musicians. The family performed each week on KTVO TV and KIRX 1450 AM Radio, calling themselves The Sally Mountain Show. They played local shows, and the band consisted of Johnny, Carolyn, 5 year-old Rhonda, father Bill Vincent, brother Pearl Vincent and his wife Kathryn, and their sons Ricky and Joe, along with friends. Darrin Vincent was born on December 27, 1969. Johnny spent most days with his father; hunting, fishing, and making music. His father passed in 1972, changing the face of The Sally Mountain Show. The band became Johnny’s immediate family, Carolyn and Rhonda. They performed as The Sally Mountain Trio until Darrin was old enough to join the band. Darrin quickly became proficient on many instruments and learned the signature harmony vocals his father was known for. Brian Vincent was born on January 25, 1974. Brian learned to sing and play, and joined the family band. His incredible voice was reminiscent of Bobby Osborne. After attending several bluegrass festivals, Johnny discovered that he could make a living performing with his family, keeping his family close. The Sally Mountain Show grew in popularity, gaining national attention in 1981 when they were picked up by The Lancer Agency out of Nashville, Tennessee. Johnny and his family toured the world, performing their special brand of bluegrass music. He was known for his unique banjo style, along with his smooth vocals. In 1986, Johnny bought 63 acres in Queen City, Missouri and made one of his greatest dreams come true by hosting his own bluegrass festival at Sally Mountain Park. The festival has continued ever since, and lovers of the music travel from around the world to experience the down-home hospitality of the family festival. Johnny’s many special friends volunteer their time to help at the festival and kept him company when he was unable to get out and about.